Animal organs. Digestive system. Small intestine. Atlas of plant and animal histology. Organ: digestive system, small intestine. Species: rata. (Rattus norvegicus; mammal). Technique: paraffin sections stained with A) Masson's trichrome; B) haematoxylin-eosin. After the stomach, the small intestine, or small bowel, begins in the pyloric orifice, and ends in the ileocaecal valve, where the large intestine begins. Small intestine is a large tube, more than 6 m in humans, divided in three regions: initial or duodenum, around 20 cm long, intermediate or jejunum, about two fifth of the total length, and final or ileum. Most of the digestion occurs in the intestine. Chyme (or chymus) is the name of each portion of food partially digested coming out from the stomach to the small intestine. In the duodenum, chyme gets in contact with secretions of the pancreas containing enzymes and bile salts, both leading to a further degradation as the food moves along the intestine. Moreover, in the surface of the intestine, there are enzymes helping with the digestion. Small intestine is the region of the digestive tube with the more absorption rate of the resulting digested products, like amino acids, carbohydrates and lipids. Water and ions are also absorbed in the small intestine. Like the rest of the disgestive tube, the small intestine is made up of mucosa, submucosa, muscularis propria and andventitia. Mucosa consists of three layers: epithelium, lamina propria and muscularis mucosae. Mucosa has structures that increase the inner surface of the tube so that the total absorbing surface is larger. Villi of the small intestine of a rat. On the left, the picture shows a transverse view of the small intestine. 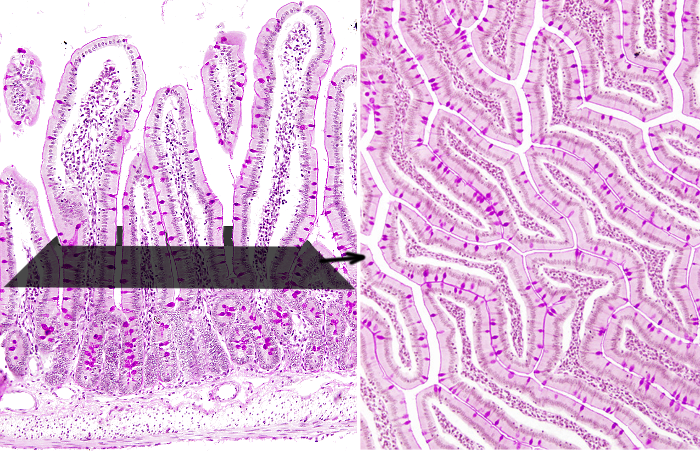 On the right, a picture of a section paralell to the surface fo the small intestine wall (indicated in black on the left picture). The inner surface of the small intestine is formed by many expansions of the mucosa, showing glove finger-like shape and 0.5 to 2 mm long. These expansions are known as intestinal villi. In the duodenum region, they show a more blunt tip, whereas in the jejunum are sharper. They increase enormously the epithelial surface, and therefore the number or epithelial cells available for absorption. Each expansion (villus) is made up of simple columnar epithelium in the surface, and loose connective tissue under the epithelium forming the lamina propria of the mucosa. Lamina propria contains many immune cells, some smooth muscle cells, as well as fibroblasts. There is also a dense net of blood vessels with fenestrated endothelium (with gaps in the endothelial cells) in the interior of each expansion. The blood network allows an efficient removal of absorbed substances by the epithelium. A net of lymphatic vessels is also found in the villi. Scanning electron microscopy of the small intestine. 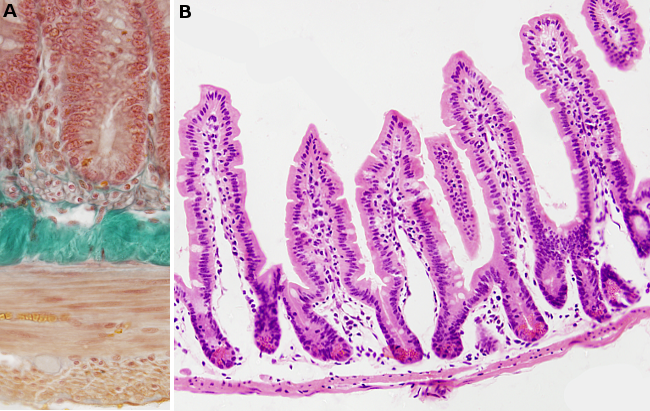 Villi are observed at lower magnifications (images of the left and in the middle). Microvilli of the epithelial cells are observed at higher magnification (image on the right). At the base of the villi, there are the excretory openings of the intestinal glands, also known as crypts of Lieberkühn. The secretory part of these glands are found among the muscularis mucosae, their excretory ducts run through the lamina propria and finally they fuse with the intestinal epithelium. As mentioned above, connective tissue forms the lamina propria, that is found the interior of the villi, but also at the base of the villi, surrounding the intestinal glands. In the lamina propria there are many immune cells either scattered or grouped in nodules. In the Ileum region, the nodules are found aggregated forming the intestinal Peyer's patches. Muscularis mucosae consists of two layers of smooth muscle cells: an inner layer with circularly arranged smooth muscle cells and an outer layer with smooth cells arranged longitudinally. In the epithelium, there are five cellular types: enterocytes, globet cells, Paneth's cells, enteroendocrine cells and M cells. Enterocytes are the most abundant cells and the main responsible for the absorption of nutrients from digestion. They also release some digestive enzymes into the intestine lumen. The apical surface of the enterocytes (the plasma membrane domain facing the lumen) are highly folded forming microvilli. These membrane folds increase enormously the effective absorbing surface of the cell, and therefore of the intestine, that is added to the increase in surface provided by villi and by the circular folds. Intercellular spaces between enterocytes are sealed by tight junctions and adherent junctions (see cell junctions), preventing molecules from the lumen to freely cross the epithelium. After the enzymatic degradation of food, virtually all molecules must cross the interior of an enterocyte to be incorporated into the body. Therefore, the internalization of molecules from the small intestine lumen to the blood is a selective and controlled mechanism. Globet cells are distributed along the small intestine and are less numerous than enterocytes. They release mucous substances that cover and protect the luminal surface of the intestine. Paneth's cells are found in the deeper part of the intestine glands. They release several types of enzymes that are thought to control the bacterial flora. Enteroendocrine cells release hormones like secretin, colecystokinin, gastric inhibitory peptide and motilin. Each of them with different roles, like influence the liver activity or modify the peristaltic movements of the intestine. M cells process microorganisms and molecules from the intestinal lumen and present them to the immune system cells, which are in the lamina propria. Submucosa is a layer of dense connective tissue, with some scattered adipocytes. In the duodenum, the duodenal glands, or glands of Brunner, are specialized in releasing an alkaline secretion to neutralize the very low pH of the partially digested food coming from the stomach. This layer is made up of two sublayers of smooth muscle: one inner circularly oriented and another outer longitudinal oriented. Between the two sublayers, there is a plexus of nerve terminals called Auerbach's plexus (or myerenteric plexus). Each muscle sublayer performs a different type of contraction with a particular role. The inner one move the digested food forward and backward to mix properly with the digestive substances and to renew the liquid in contact with the surface of the epithelium for a better absorption. The outer longitudinal layer contracts the gut tube and moves the digested material toward the large intestine. Serosa is connective tissue forming the outer layer of the small intestine. In some regions is convered by the peritoneum.